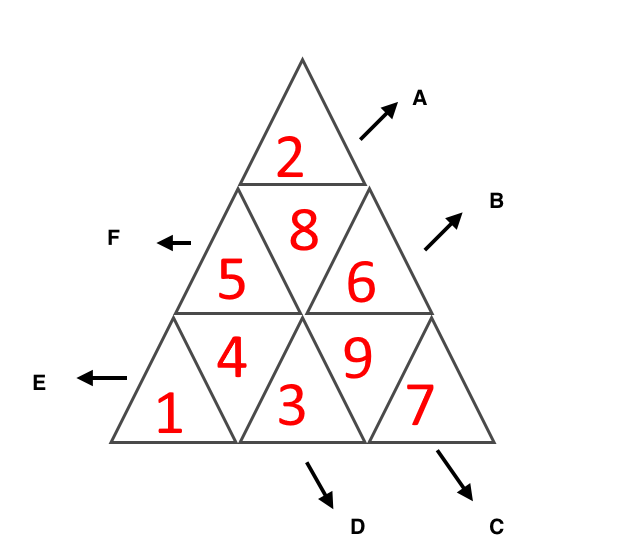 All the whole numbers 1−9 are placed in the 9 triangular cells. A negative sign is placed in front of some numbers. The letters A−F are products of 3 or 5 of the numbers. Find all possible solutions. Let's begin by ignoring the +/- signs. 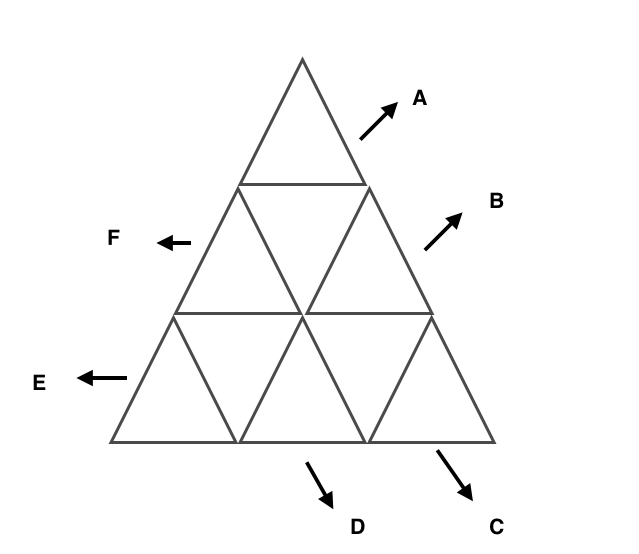 First of all, it's easy to get the corners: we know the product of all the cells, and then pairs like A,B give us the product of "all but X" for each corner X. Now we can look at the three remaining cells on each long side, and pin down what numbers have to be there; e.g., the remaining cells on the NW side have a product of 160, which can be implemented only as 4x5x8. The rest is straightforward. have to figure out the signs. There are 9 cells and 6 constraints on the signs (which you can think of as linear relations over the field with 2 elements, if you're feeling fancy) and it's fairly clear that they're independent: so there must be 9-6=3 independent things you can do without changing the signs of the given products, and a little trial and error suffices to discover what they are. Then we just need to find one configuration of signs that gives the right results. Considering once again the products of all numbers and all-but-a-corner, we see that the SE corner has to differ from the other two; let's make it negative and the others positive. The given products have a symmetry about the obvious line through that corner, so let's look for patterns symmetrical about that line. Then it's just a little trial and error again. Not the answer you're looking for? Browse other questions tagged logical-deduction sudoku or ask your own question.